These boots are toast. Another pair bites the dust. Actually, they’ve been biting dust (and mud and rocks and logs) since I took them out of the box in 2009. 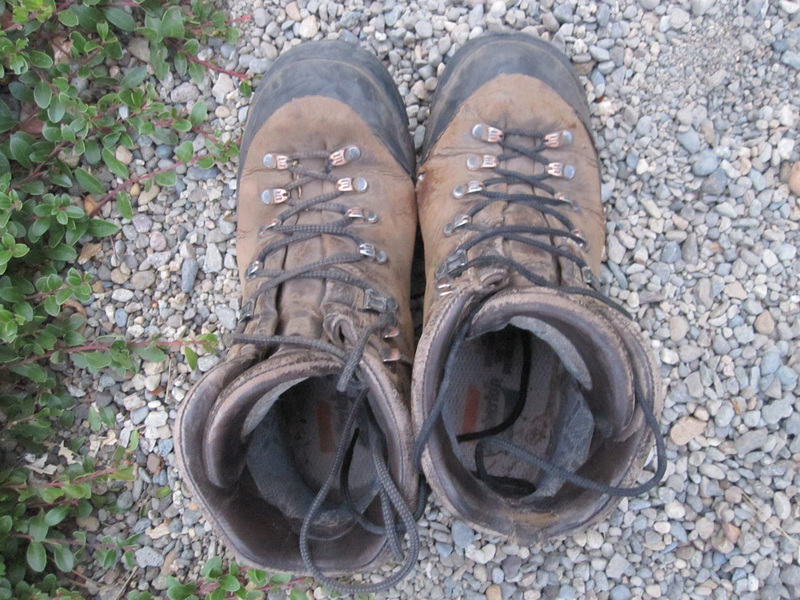 Modern hiking boots can take about two seasons on trail crew before they disintegrate. They’re high tech, lightweight, lined with Gore-tex and just not up to the job. I still pine for the old Raichle waffle stompers I had in the late 70s. Those were durable. Today I sucked it up and drove over the mountains to that foofy outdoor retailer in the Puget Sound area. I was looking for another pair of Zamberlans for the fit. I tried on a pair of full leather ones, and they didn’t feel right. I always buy men’s boots because I have wide feet, and they tend to be built a little sturdier. The clerks try to direct me to the women’s boots and I wave my hand dismissively. Pure fluff. So I turned down the Zamberlans. The only other leather boot was the Asolo 520, described by the clerk as a “Lexus for your feet”. Hm. It came in a wide size, and felt pretty good. I bought. I had to do something about being shod for work. Paying $300 for something that lasts only two seasons makes me vaguely nauseous. I paid $300 for custom-built fire boots that can be sent back to the company and rebuilt again and again. They fit perfectly, and will last for years. Too bad they’re not good for trail work. The higher heel is designed for off-trail hiking, and causes my knees to go wacky if I wear them on a regular trail. So hiking boot manufacturers, here is my wish list for a trail crew dream boot: full grain rough-out leather upper; limited goofy rubber rands–they always de-laminate; sturdy hooks and eyelets that don’t squish down on the laces when you smash your foot against a rock; roomy toe box; snug padding around the ankle; a sole that gives a slight rocking motion to each step for forward propulsion; aggressive tread; repairable and resole-able. It doesn’t matter if they’re ugly as long as they feel good and hold up in the field. I’ll start breaking in the Asolos. And be surprised if they turn out to be the Lexus for my feet. Stay tuned. Good luck with the new footwear tomorrow. You and your feet are the ultimate test of a boot that’s claimed to be the “Lexus”. After your”threats” about leaving a comment here, I thought I’d better come out of the woodwork and make one. Rest assured, I ALWAYS read your posts and I look forward to them. I like your writing style and the subject matter. Photos and drawings make them even more interesting. DON’T STOP! !